White Cloud Press, 9780974524566, 287pp. Sumbul Ali-Karamali grew up in California, balancing her South Asian, Muslim, and American identities. Often the only Muslim her acquaintances knew, she had ample practice answering questions about Islam and Muslims. ("What do you mean you can't go to the prom because of your religion?") While working as a corporate lawyer, she was repeatedly asked to recommend books on Islam, so she decided to write a book that was both academically reliable and entertaining to read. Consequently, she moved to London and earned her L.L.M. in Islamic Law from the University of London's School of Oriental and African Studies. She served as a teaching assistant in Islamic Law at SOAS and a research associate at the Centre of Islamic and Middle Eastern Law in London, and then she wrote The Muslim Next Door for everyone who ever asked -- or wanted to ask -- a question about Islam. 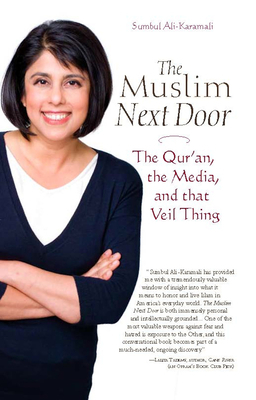 "I wish I could send a copy of The Muslim Next Door not just to every Muslim extremist, including Bin Laden and his likes, but also to the President of the United States and his staff, to all policy makers, and also to every single Islamophobe or self-hating Muslim in the world. If they read and understood this book, most certainly our world would become a much better place to live. Since the terrorist attacks of 9/11, the publishing world has generated a virtual flood of books on Islam and Muslims, and the vast majority of what has been published is no better than pseudo-intellectual drivel. In my view, however, The Muslim Next Door is solid intellectual gold! This book easily ranks as one of the best three books published on the Islamic faith in the English language since the tragedy of 9/11. It is a profoundly eloquent, consistently reliable, comprehensive, insightful, and often brilliant testament of what it means to be a Muslim and what the religion of Islam is all about. Refreshing in its honesty, accessibility, and humility, and truly impressive in scope and depth, this is an indispensable book. Indeed this book is a necessary read not just for those who are interested in learning about Islam, but even more so for those who believe that they have learned all there is to know about Islam." "There are few books that I would genuinely recommend to everybody I know, and you are holding one of them. Sumbul Ali-Karamali has written a lovely, lyrical and learned book about living Islam. Whether you are an expert in the subject or a novice, a skeptic or a believer, you will find this book a treasure." Reza Aslan author "No god but God: The Origins, Evolution, and Future of Islam"
"Sumbul Ali-Karamali has produced an intelligent, sensitive and highly readable study of Islam as it is experienced and interpreted by most Muslims. An important work that does an excellent job contextualizing common misperceptions of Islam, as well as challenging the distorted views of the extremists and the prejudices of the Islamophobes." "Sumbul Ali-Karamali has a gift for explaining the ins and outs of Islam in a language understandable by all. As a practicing Muslim, she puts a human face on a religion that is grossly misunderstood and often feared in America. I recommend this book to anyone who wants to learn more about Islam from someone who lives it"
- Firoozeh Dumas author of "Funny in Farsi" and "Laughing Without an Accent"
"Sumbul Ali-Karamali lives according to her faith, with humor, good grace and brilliance, so when she shares her insights, they ring true. Her book is a classic you will remember because she has bared her soul. Sumbul mixes scholarly insight about Islam with a personal, well-considered perspective on being a mainstream American Muslim. She brings perspective to the words and customs of Islam. Sumbul's charming openness about family life, her honesty about her own questions, her simplicity about living practically, and her down-to earth view of reality make the book really worth reading. I was a Catholic nun in my early life, so took particular interest in this modern, savvy woman's faith, which was, to be frank, a little scary to me. This book is fascinating; I couldn't put it down. I recommend it whole-heartedly to people of good will who are grappling with questions about Islam and Muslim in America today." "Sumbul Ali-Karamali provides refreshing insight into an impressive range of issues concerning Islam. Her book is the journey of an American Muslim woman struggling with her identity, her tradition, and most importantly, her desire to simultaneously fit in with American culture while preserving her faith. Through the use of both personal anecdotes and extensive evidence from the Islamic tradition, she provides easy-to-read, credible, and thought-provoking analysis. Intended primarily for non-Muslims seeking to understand their Muslim neighbor, Muslims will also see much value in Ali-Karamali’s book."